New York (October 16, 2013) – Once again Electronic Arts Inc. (EA) wowed videogame fans and media at “The Download: EA 2013 Preview,” the top game publisher’s must-see press event held during the 2013 Electronic Entertainment Expo (E3) in Los Angeles. 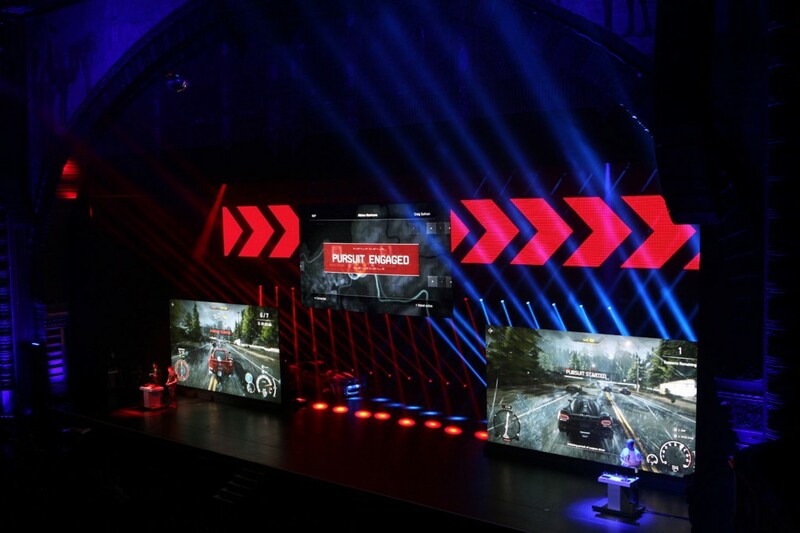 WorldStage returned for the sixth consecutive year to provide AV support for the event, which looked at upcoming titles via live demos, world premiere trailers and breaking news. The action-packed preview was telecast live on cable’s Spike TV and streamed worldwide via multiple webcasts. The event began with the surprise reveal of the first-person shooter game, Plants vs. Zombies Garden Warfare,a stunning new game originated from the famed franchise that pays homage to the action genre while retaining the signature quirky humor, depth and accessibility that fans love about the Plants vs. Zombies franchise.. The show also featured NBA star Kyrie Irving to introduce new bounceTek ball physics for NBA LIVE 14 and hip-hop artist Drake took the stage to showcase gameplay for FIFA 14. Need for Speed Rivals debuted All Drive, a mode that blurs the line between single-player and multiplayer racing experiences. The event closed with an astounding live 64-player multiplayer demo of Battlefield 4. Three 13×25-foot PixeLED F6 high-resolution 6mm LED walls, were positioned at the left, center and right of the stage to display speaker support, title slides, IMAG and game footage and demos. The center LED wall flew in and out and the two side walls moved on and off stage on custom-built carts that traveled up to eight feet per second. The LED wall movements were choreographed to sync with lighting and stage calls. Additionally, three PixelLED F40 low-resolution 40mm LED walls served as background and scenic visuals. In addition to the LED Screens, a 45×25-foot front projection surface was flown in to showcase the 64-player Battlefield 4 demo, and several other segments. Video playback was handled by the proprietary WorldStage Media Hub; a Vista Spyder X20 switched all sources to the screens. Equally, if not more important was the quality of the feed to the webcast and to support that component WorldStage supplied a seven HD-camera system, including three with long lenses, one on Steadicam, one hand-held, and one on a 30-foot jib. One of WorldStage’s Ross 3.5ME Vision Mixers was used for camera cuts for the live telecast. At WorldStage Jack Dussault was the project manager, Neal Gass and Carl McMillan the video engineers, and Bryan Dominick lead projectionist.